Fishing lures have always captivated me. Beyond just their layers of thick paint and shiny varnish, there is something magical about them. That you can toss them into a body of water and (with some patience) reel in a live creature is one of those simple things in life that makes me happy. It's a little bit like the feeling I get from planting a seed in my garden and eventually having something I can actually eat. Or converting a blank canvas into something that someone might hang on their wall. That's my own practical magic! 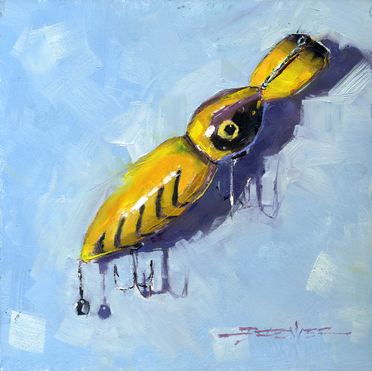 I'm beginning a new series of fishing-lure paintings from items in my own tackle box. I have blogged about the similarities between painting and fishing so it seems like a natural fit. If I like the way these are going I may eventually begin buying vintage plugs and painting them as well. I think it might make for a great gift for that fisherman in your family to combine the painting with the actual vintage lure. I may play around with the idea of framing them together...we'll see. Each painting will be an 8x8-inch oil on panel and painted in still-life format in my studio. 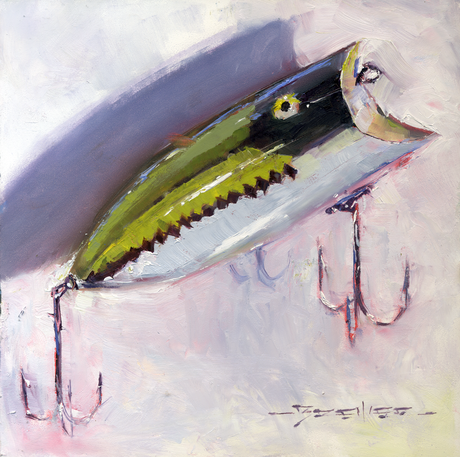 This first painting features a Heddon Lucky 13 top-water lure that I managed to use with a lot of success (catch and release only). It's simplicity and beauty is something that is hard for a black bass to resist. Tried and true for many generations.